The world’s largest paraquat producer is china, producing more than 80% of paraquat produced worldwide. 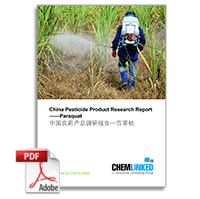 The production of paraquat SL in China for the domestic market is prohibited since July 1, 2014. The first paraquat formulated product other than SL has just got a production approval by the largest Paraquat manufacturer REDSUN. Several new paraquat formulations are being developed. The conditions to produce paraquat formulated product other than SL are due for release. Out of a total of 41 registration certificates 7 registration certificate of SL formulation for export remain valid. There are primarily three methods used in the treatment of waste water occurring in the manufacturing of paraquat.